Sri B.Anil (Advocate) has over 16+ years as an experienced Consultant, with focused on several areas of Technology, Management and Law. As a Legal Advisor, Anil can help with Initiating, Planning, Executing, Monitoring and Controlling and Successful Closure of a plethora of Legal Solutions surrounding the entire gamut of Legal Compliance that pertain to a Company or Corporation. As a Legal Specialist, Anil can advise, manage and develop and deliver detailed work elements, tasks, critical milestones and contingency plans to achieve to meet compliance and statutory requirements to support your Company’s legal needs. 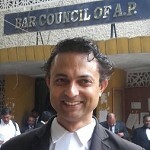 Anil has a solid understanding of Procedural Laws –Civil and Criminal as well as application of Rules pertaining to Writs, Petitions, Plaints, Appeals et seq., in Courts — Tribunals, District, Metropolitan and High Court(s). - Designing and implementing legal compliance for business solutions for clients, particularly with a focus on Corporate Law. Conversant with all aspects of Companies Act, 2013, Securities Contracts (Regulation) Act, 1956, SEBI Act, 1992, Industries (Development and Regulation Act), 1951, Foreign Exchange Management Act, 1999, Consumer Protect Act, 1956, SEBI Regulations, 2009, Right To Information Act, 2005 and Corporate Governance, inter alia.